An 8 wire stepper commonly has 4 separate coils. You can identify them using a simple ohm meter, this you can sort out four pairs of cables. If you do not have a ohm meter, use one of your driver’s output (If your driver has A1 A2 B1 B2, use A1 A2). Randomly plug two out of the eight leads into your driver until the motor shaft vibrates, that two lead belongs together. Now suppose you have found your 4 coils, you need to figure out which two belongs to the same pole, and the polarity of the leads. assuming that the coils are named P Q R S. Where P Q is on one phase, R S on opposite phase. First pick one coil and name the leads P1 P2, this will be connected to you driver’s A1 A2. Pick another coil and plug it to the driver’s B1 B2, if motor vibrates but not rotate, that coil is on the same phase as coil P, ignore that coil now, try another coil. If the motor rotates, it is the coil on the other phase. If that configuration spin in clockwise, name the leads in B1 as R1, B2 as R2, if it spins in counter clockwise, reverse two leads in B1 B2 and that should make the motor spin clockwise, name them. Repeat that on the other opposite coil, name the leads S1 S2, make sure the motor spins the same way. Next, keep S1 in B1 and S2 in B2 and plug in the remaining unknown coil to driver A1 A2. If motor spins clockwise, name the lead in A1 as Q1, A2 as Q2, otherwise, swap the two unknown wire, that should make the motor spin clockwise, name them. Now you have all 8 leads named, wire them as you wish in a 8 wire, 4 wire (parallel), 4 wire (series) or 6 wire configurations. 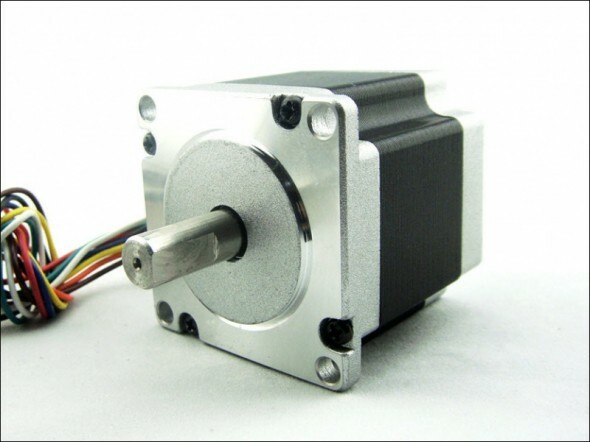 Note: This Arduino website points you to the basics of a bi-polar stepper motor in case you don’t know how it really works. Pingback: 8 wire Stepper motor wiring connection - CNCzone.com-The Largest Machinist Community on the net!